This birthday celebration is brought to you by the power of Twitter. 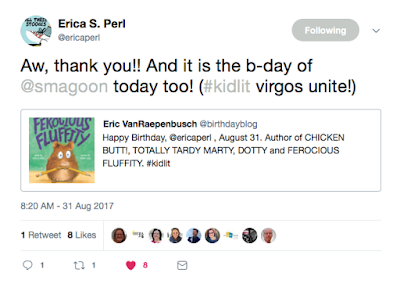 Last year (2017), I tweeted Erica S. Perl to wish her a "Happy Birthday" and she replied back that she shares a birthday with Scott Magoon. 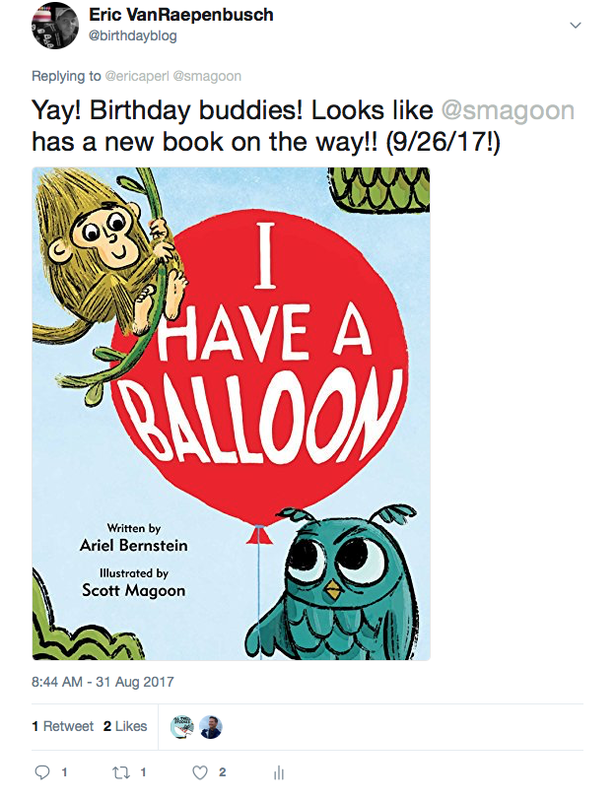 Scott Magoon is the author-illustrator of Boy Who Cried Bigfoot! and Breathe. He has also illustrated books for Kate DiCamillo (Spoon and Chopsticks) and Ame Dyckman (Misunderstood Shark). 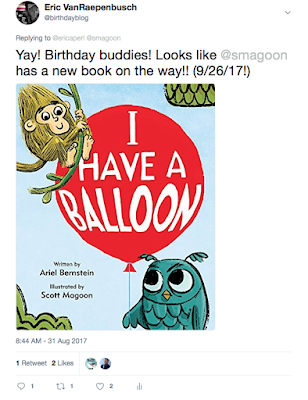 Upon, finding out that Erica S. Perl and Scott Magoon were birthday buddies I tweeted Scott to congratulate him on his book, I Have a Balloon. 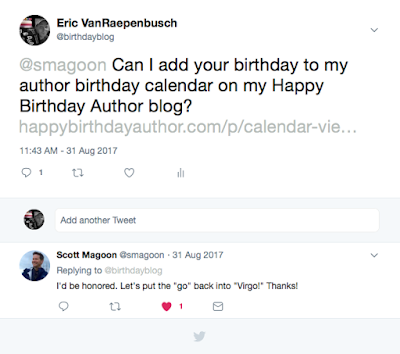 I asked Scott if we could add his birthday to our growing author and illustrator birthday calendar. 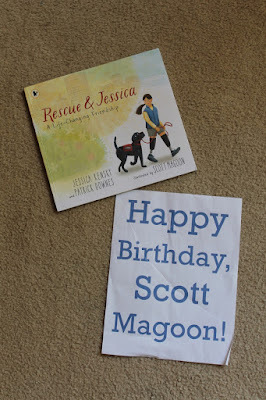 Let's fast forward to this year (2018)...I thought it would be fun to have a Twitter-inspired birthday celebration for Scott who illustrated the 2018 New York Times Best Seller, Rescue and Jessica: A Life-Changing Friendship. We would be meeting the authors of Rescue and Jessica: A Life-Changing Friendship, Jessica Kensky and Patrick Downes, on September 1st at the National Book Festival 2018 and I had a quick and fun way to let Scott know we were thinking of him. 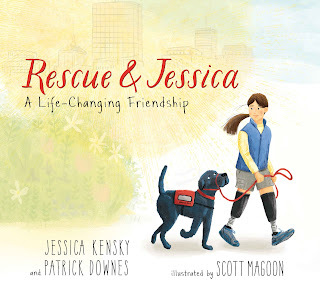 Rescue and Jessica is a courageous story about Jessica and her service dog, Rescue. Rescue learns he is more suited to be a service dog despite be trained as a guide dog. Jessica learns she will be an amputee after suffering a tragic injury at the Boston Marathon in 2013. They are both worried about what the future holds but their perseverance leads them together. Together Rescue and Jessica form a friendship like no other. Before leaving Ohio for Washington D.C. I had everything I needed for our Twitter birthday celebration. 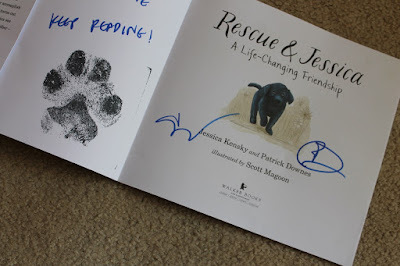 Upon meeting Jessica Kensky and Patrick Downes, I explained our blog and asked if they would share their birthdays with us (Jessica's is March 1st and Patrick's is June 8th). 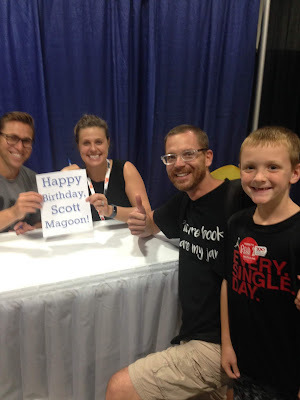 Then, I asked if they would help us celebrate Scott Magoon's birthday right there in the autographing line! 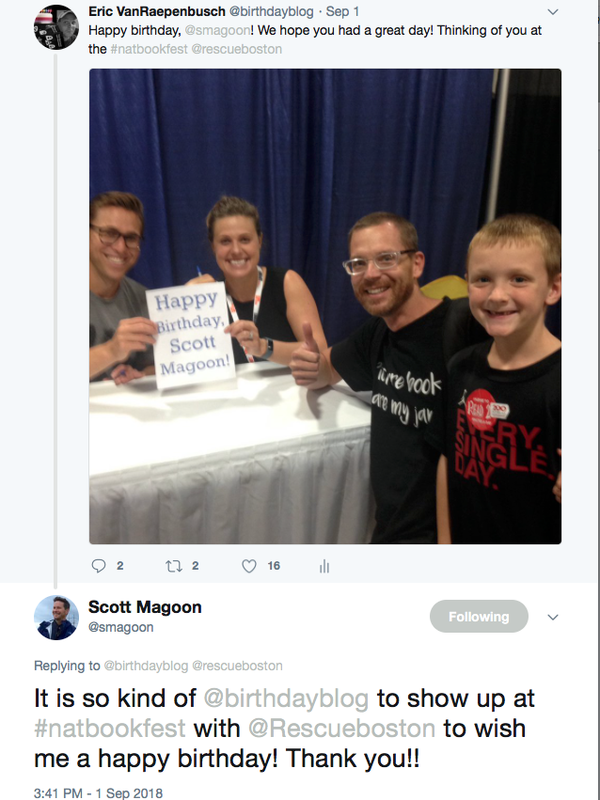 I tweeted the photo to Scott and he replied right away! Yay! Our first ever Twitter birthday party! A huge thank you to Jessica and Patrick (and Rescue) for helping out and for signing our book. 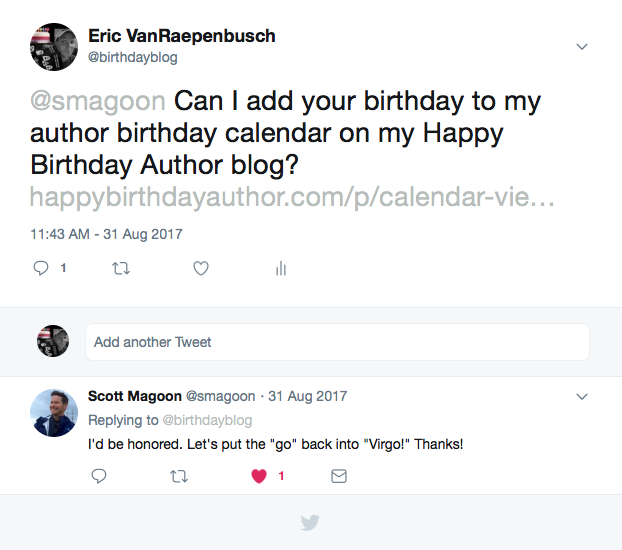 I hope to add Scott Magoon's autograph to our book when he visits the Mazza Museum for the Weekend Conference on November 8-9, 2018!